There are some very lucky parents out there whose young children look forward with much anticipation to visiting new restrooms. For them, discovering the uncharted territory of facilities at the aquarium, zoo, or back storage area of the supermarket are opportunities not to be missed. And a Turkish or pit toilet may provide a solid hour’s worth of entertainment for—and questions from—some eager children. But for most of us, potty training can become even more challenging when restroom availability is unpredictable and the facilities are clearly not those of home. Changes in time zones and diet can also affect a child’s regularity, which can lead to unpleasant surprises and diminished confidence. And then there is the fear that may strike in any potty-training child’s heart the moment they discover—too soon—the automated power-flush of an airport toilet. Yes, potty training regression is not unheard of during travel, and with good reason. Yet, if your child is well on his way or has already conquered potty training at home, there should be no stopping you now. Here are some tips to help in your travels with potty-trainees and those recently potty trained. 1. Paint a clear picture for your child. While it’s easy to focus on the details of the family adventure that lies ahead, don’t forget that bathroom breaks are a big new part of his world already. Let him know what to expect in the way of aircraft lavatories, rest areas, or campground facilities, and introduce any new travel potties or equipment in the weeks before you leave home to ensure that he’s as comfortable with these items, and the options, as possible. New facilities may bring on performance anxiety, and exciting days packed with sightseeing and activities can make it hard for small children (and sometimes their parents) to remember to take potty breaks in a timely manner. Some parents find it helpful to set a reminder chime on their watch or phone, which can not only help them remember to do a “potty check” but can also help by putting an objective and neutral third party in charge of potty breaks (not Mommy or Daddy who want to interrupt the fun). If you struggle to hold your hand over the sensor and keep your child balanced on the toilet, carry a small pad of sticky notes to place over the “magic eye” before you put anything or anyone near the seat. In a pinch, you can also use a Band-Aid, moist toilet paper, or used chewing gum (best not to let your child see this desperate maneuver). When your child is finished, let her get as far away from the toilet as she likes before removing it. 4. Bring a travel-friendly potty or seat. The 2-in-1 Potette Plus simplifies potty training during travel. If your child is nervous about public restrooms in general, or they may not always be available when needed (as on a road trip), it will be helpful to have a folding or inflatable travel potty she can practice using at home and continue to use during travel (affiliate links help support this site). Multiple brands are available, including the Potette Plus 2-in-1 travel potty and training seat, which folds flat and can be used both as a potty with disposable liner and inserts, and also as a child-size seat on top of a regular toilet. 5. Rent a training potty or child-size seat for your stay. If you’ll be staying in one place for most of your vacation (at a resort, relative’s home, etc.) and already plan to rent baby or toddler gear, you might be able to rent a potty or potty seat along with other gear for your stay for a very minimal fee (see more about baby gear rentals, pg. 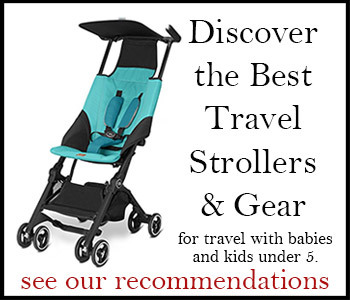 82, and find an agency at your destination in the Worldwide Directory of Baby Gear Rentals at TravelswithBaby.com). You’ll find more tips for travel during potty training in Chapter 5: Preparing for Changes in Travels with Baby: The Ultimate Guide for Planning Travel with Your Baby, Toddler, and Preschooler. Don’t forget our helpful “Pack This!” features for more ideas on helpful gadgets and gear to ease your family’s travels.